It was only sometimes back when we were celebrating New Year and now already 2 months of the new year have passed by and March is here. One thing to look forward to in this month is the Indian festival of Holi. I had ranted a bit about it here last year. I have already geared up with a list of dishes to be prepared for this festival. To start off I have made this Thandai. This recipe comes from one of my favorite blogger, Rachana. I had bookmarked this recipe long back, but didn't make it till now since I didn't have the rose petal spread - gulkand, at hand. You can leave it out, but I wanted to follow the recipe to the T. So, I brought it on my last India visit. 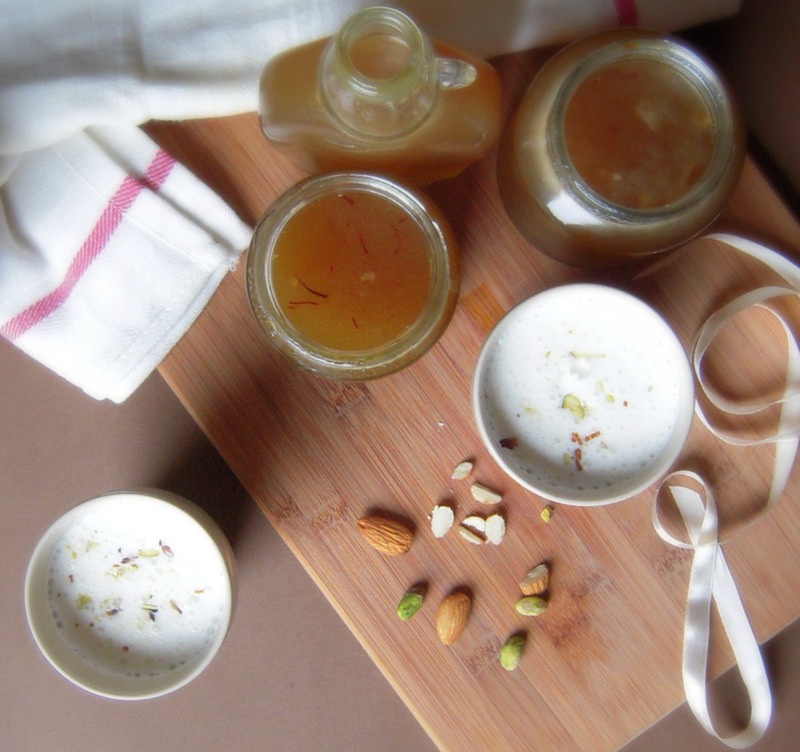 This recipe is unique from other on the web, cos Rachana gives a step by step method to make thandai syrup which last for months and once it is made, thandai can be whipped up in no time. I can safely say that I am going to make it again when my present stock of thandai syrup is over. Lets hop over tot he recipe. 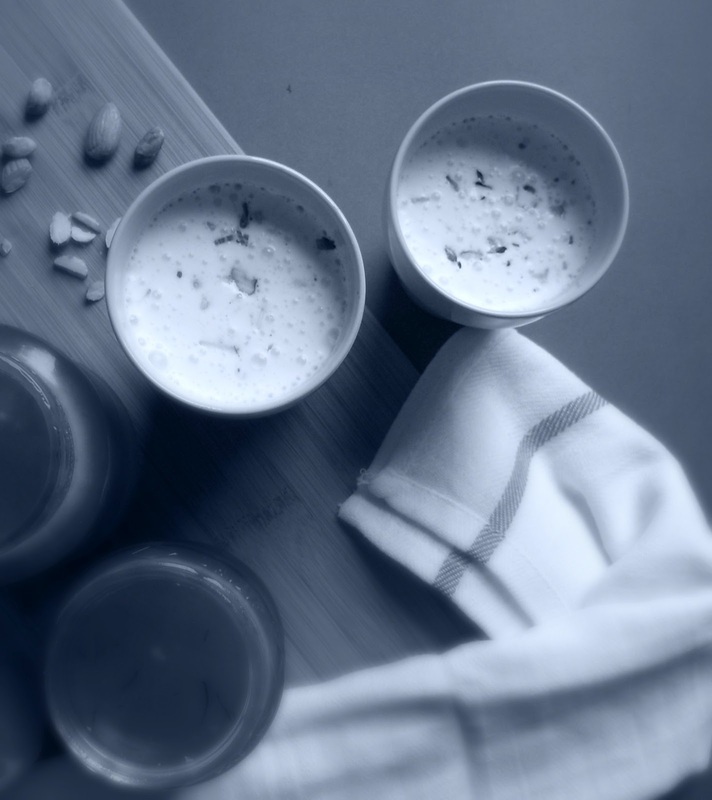 Grind together the blanched almonds, poppy seeds and melon seeds using very little water. Strain through a muslin cloth and extract all the liquid and keep aside. Add the rose petal spread to the ground cardamom-pepper-fennel mixture and mix well. Strain through a muslin cloth and extract all the liquid and keep aside. Discard the residue. Mix both the extracted liquids and keep aside. Meanwhile add the 4 cups of sugar and 1 1/4th cup of water in a deep pan and cook until the sugar dissolves. Bring to boil and simmer for a couple of minutes. Remove from the heat and let it cool for a couple of minutes. Add the extracted liquid to it and stir. Remove from the heat and cool till warm and then add the saffron strands or rubbed saffron mixture, cardamom powder, pepper powder and rose water and mix well. When the thandai syrup completely cools down store it in sterilized bottle/bottles. It will keep well for months. 1. If sugar crystals are formed while cooling the Thandai Syrup, add ½ cup of boiling water to it and stir. 2. I didn't rub the saffron before adding to the syrup so, it did not give out much color, but the flavor was there. 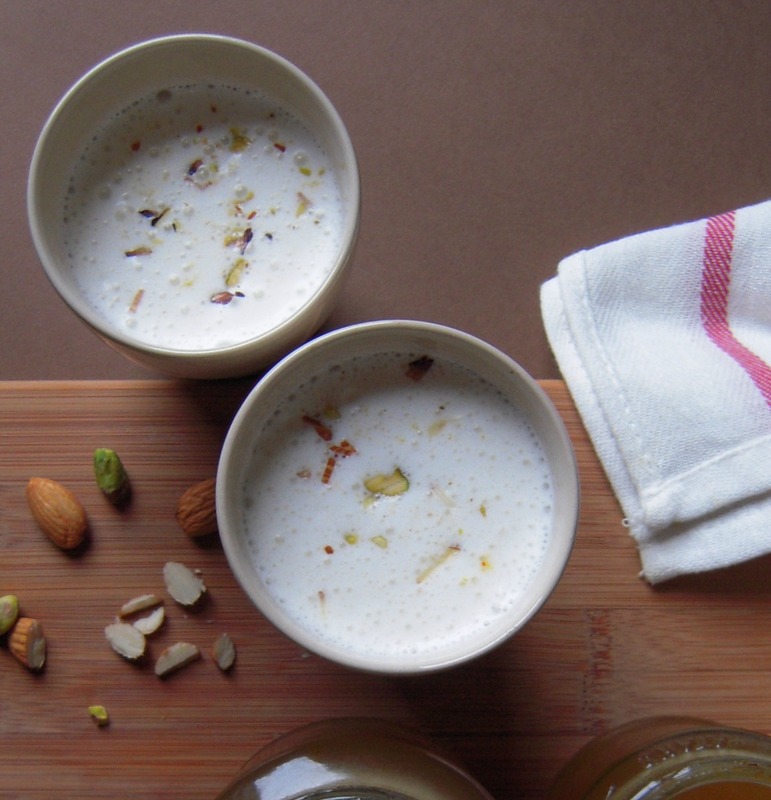 To prepare thandai to serve 1, add 2-3 tsp of the prepared syrup to 200 ml of cold milk and whiz in a blender. Garnish it with chopped nuts. Add ice if you like and serve cold immediately. wow luks awesome..perfect for holi !!!! Delicious yummy thandai. Thanks for linking my event. 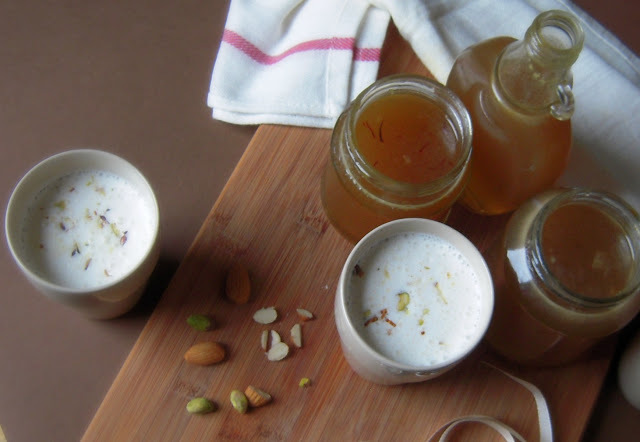 Wow, totally traditionally made thandai..looks delicious, nice presentation..thanks for linking it to Spotlight : Holi. Wish to grab that glass of thandai from the screen and enjoy :-) You have presented it beautifully. Homemade gulkand is anyday better than the store bought ones. I love thandai! My mum makes 'kaanji' too. If you have taste buds which love tangy and spicy fare, do try that too. Awesome clicks,,,:) thandai is my fav too,..